This article is about the software by Apple Inc. For disk utilities in general, see disk utility. Disk Utility is a system utility for performing disk and disk volume-related tasks on the macOS operating system by Apple Inc. Disk Utility functions may also be accessed from the macOS command line with the diskutil and hdiutil commands. In the classic Mac OS, similar functionality to the verification features of Disk Utility could be found in the Disk First Aid application. Another application called Drive Setup was used for drive formatting and partitioning and the application Disk Copy was used for working with disk images. Before Mac OS X Panther, the functionality of Disk Utility was spread across two applications: Disk Copy and Disk Utility. Disk Copy was used for creating and mounting disk image files whereas Disk Utility was used for formatting, partitioning, verifying and repairing file structures. The ability to "zero" all data (multi-pass formatting) on a disk was not added until Mac OS X 10.2.3. Further changes introduced in Mac OS X Tiger, specifically version 10.4.3, allowed Disk Utility to be used to verify the file structure of the current boot drive. Mac OS X Leopard added the ability to create, resize and delete disk partitions without erasing them, a feature known as live partitioning. In OS X El Capitan, Disk Utility has a different user interface and lost the ability to repair permissions due to obsolescence, create and manage disks formatted as RAID, burn discs and multi-pass format internal solid-state drives and encrypted external drives. 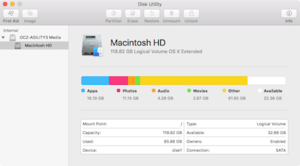 ^ "Disk Utility 10.5 Help: Testing and repairing a disk or volume". Apple Inc.
^ "Mac OS X 10.5: About resizing disk partitions". Apple Inc.
^ Landau, Ted; Frakes, Dan (December 20, 2005). Mac OS X Help Line, Tiger Edition. Peachpit Press. ISBN 9780132705240. ^ "Mac OS X: About the Mac OS X 10.2.3 Update". Apple Inc.
^ Cunningham, Andrew; Hutchinson, Lee (September 29, 2015). "OS X 10.11 El Capitan: The Ars Technica Review". Ars Technica. Retrieved September 30, 2015.